The cold this winter has led me to cocoon in my warm apartment and wait for spring. I don’t mind the cold if the sun’s out and the wind’s absent. But when it is cold, gray and windy, my choice is to stay inside unless I need to food shop or do errands. But Daylight Savings Time starts March 8th, so we will begin to see longer days. Hallelujah! Ornamental Kale, which seems to stay “in bloom” all winter and reminds me to explain the difference between this kale & kale many now eat. I admit it! I will use any excuse to write more about the importance of green foods in your diet. And what better month to do this than March, the beginning of spring and also St. Patrick’s Day! So get your green on and let’s explore the world of greens. 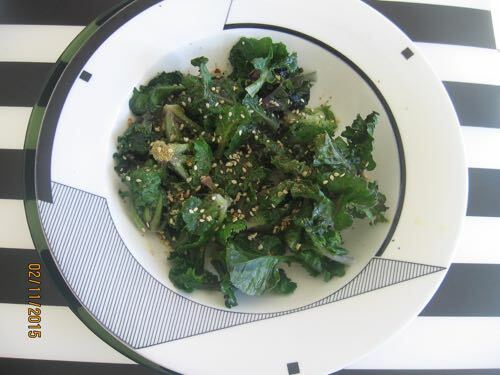 Speaking of which, there is a new food in the market, a hybrid of kale and Brussels sprouts, called either Kalettes or Sprouted Kale. 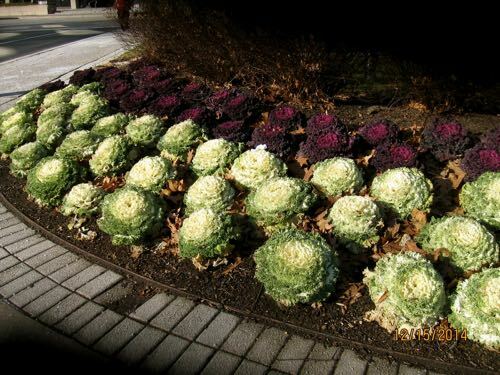 I plan to explore this new nifty green in this month’s postings, in addition to regular kale and ornamental kale, pictured above. 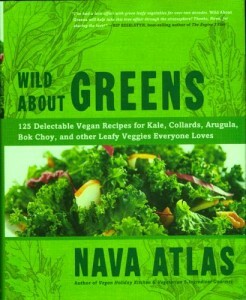 Actually, I queried a well-know vegan cookbook author, Nava Atlas, and she sent me two of her cookbooks, one of which is perfect for March. Its title is Wild About Greens and I am learning new ways to prepare and enjoy leafy greens, an important category in any diet, vegan or otherwise. In addition to Daylight Savings Time, St. Paddy’s Day, and Spring, there is also International Women’s Day, which falls on the same day as Daylight Savings Time. I will be co-chairing an event for women entrepreneurs in my area, while at the same time celebrating micro-entrepreneurship among women developing countries. This is the logo for International Women’s Day. I hope to have some photos and other information after the event. Note: It is also Women’s History Month, as well, which dovetails nicely with IWD. I hope to review the book about Barack Obama’s mother, A Singular Woman, because her life fits into both IWD and Women’s History Month. 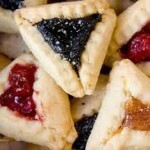 One of the most serious yet festive holidays in March is Purim, when children (and adults) dress up in costume, like Halloween, and send baskets of food to the needy. 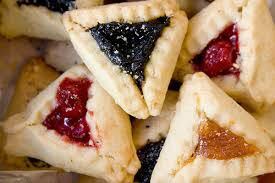 The most telltale symbol of this holiday are the hamentaschen, or three-cornered desserts that are baked and eaten on this holiday. I think I have the recipe in my archives, so I will dig it out and post it. And Palm Sunday is in March, with Easter Sunday coming in early April, so lots of celebrating is in store. Finally, Spring is when Mother Nature wakes up from her long sleep and everything begins to “sprout”: flowers, trees, plants, early greens in the garden, so I thought March would be a good time to do my annual “promotion” of sprouting at home. 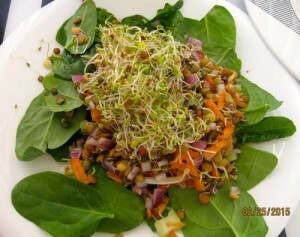 Here is a photo of my sprouted lentil salad, an easy dish with the easiest of all seeds & beans: lentils. They also happen to be nutritious. So watch for this recipe this month. Also, March is National Nutrition Month, but since I celebrate it every month, I will just mention it as a reminder that Health is Wealth. 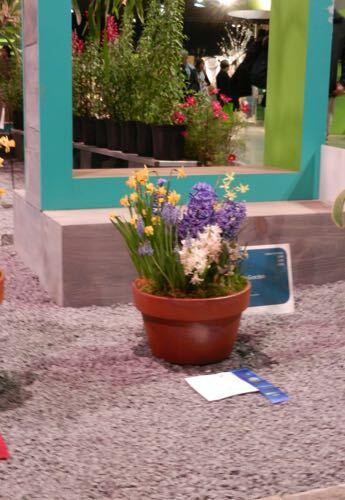 Blue Ribbon Spring Flower Pot at Last Year’s Flower Show. P.S. 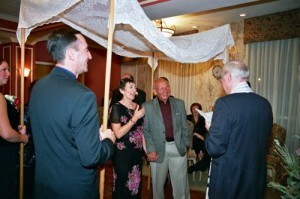 This month mark’s my 9th anniversary with Menopause. However, I have not received many comments this month, so I am wondering if my website has had its day & it is time to do something different. Your feedback important! I noted in the beginning the month (It’s over already??) that perhaps we can carry Valentine’s Day sentiments about love into the rest of the year. And these sentiments include love between lovers, love between friends, love between family members, love between co-workers, and even love between strangers, which may occuroccasionally if we are lucky. So here are two quotes from the Philadelphia Inquirer’s Cryptoquote page and two love poems I wrote when I first met my husband in 2003 and married in 2004. Since we met right before Valentine’s Day, this holiday has taken on a special meaning for me. For him, I’d pay a ransom. And help him break love’s silly rules. And dance on wide windowsills. No question is too empirical. Men can be a gentle gender. Oh, it’s a love stew I’m in. My heart is on perpetual alert. Ah, yes, sometimes Love, like crime, does pay! Is nothing short of scared. As on hope’s end I stood. Is nothing short of daring. But nite & day he’s in my heart…. Hip, hip, hooray, I cheer! They’re playing our song—let’s dance! *From a book of the same title by Eileen Simpson- I included this poem because Menopause & I wanted to share that you’re never too old to fall in love. Poetry spills from the cracks of a broken heart, but flows from one that is loved. You are currently browsing the Menupause weblog archives for February, 2015.